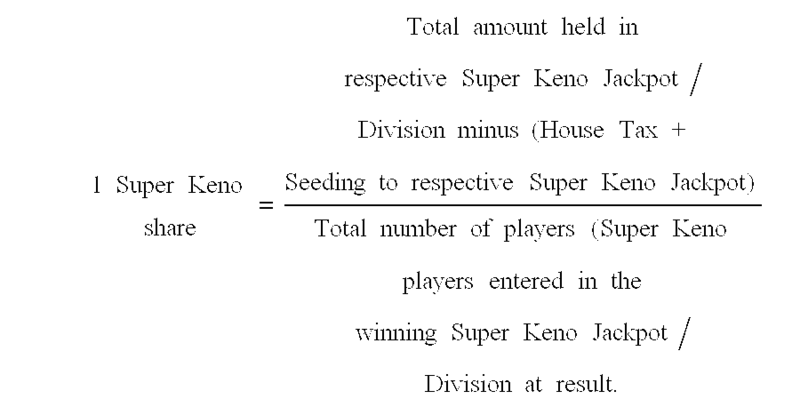 In a gambling game a collateral gambling game which can be won by players on at least one specific event occurring in the principal game, the collateral game being separate from the principal game but one when any of the possible winning events occur in the principal game, the payment to the player being calculated from the total value available for the game divided by the total number of players who bet on the specific winning event. 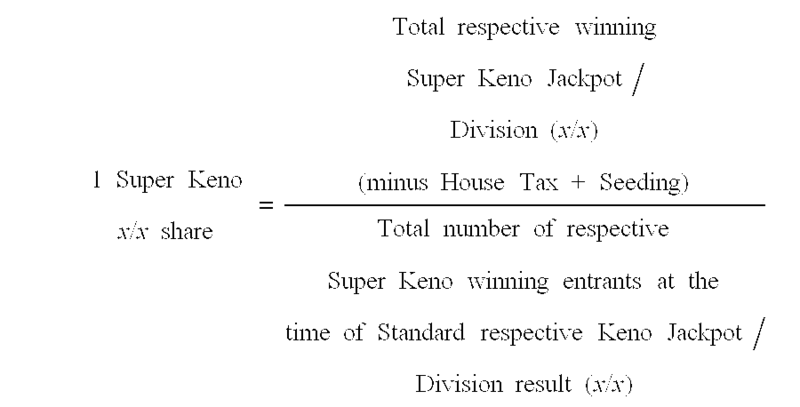 The calculation is:  1 Super Keno  share = Total amount held in respective Super Keno Jackpot / Division minus (House Tax + Seeding to respective Super Keno Jackpot) Total number of players (Super Keno players entered in the winning Super Keno Jackpot / Division at result. 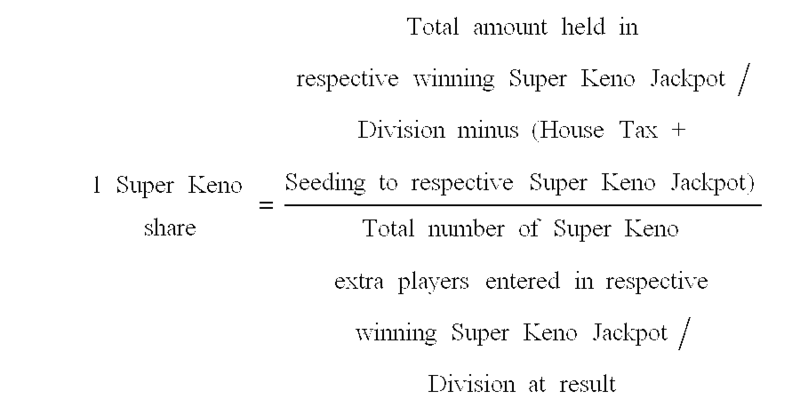 by any player playing the standard game. offered for any given game. 1. 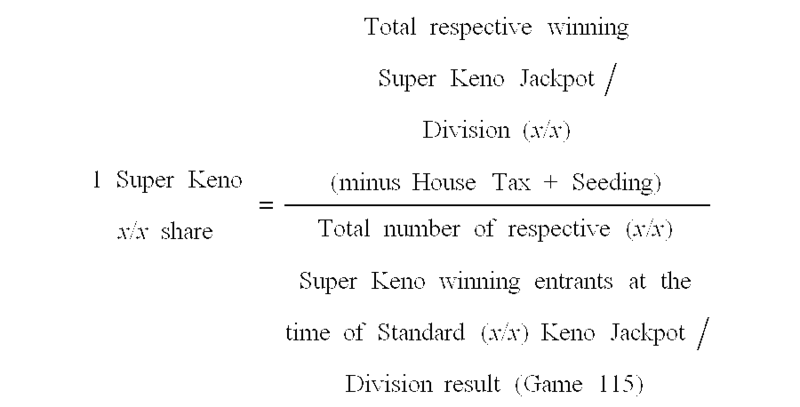 In a gambling game where there may be a number of events one of which can lead to a winning result type, a collateral game which can be entered by players of the game in respect of selecting the winning result type characterised in that on a winning result all players of the collateral game which have selected the result type are paid a share of the available amount for that result type which payment depends on the amount invested by the individual player and the total amount invested by players in the collateral game since there has last been a winning result of that result type.